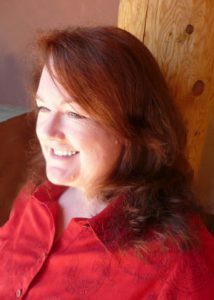 USA Today Best-Selling author Patricia McLinn interviewed me recently on her podcast Authors Love Readers. We had a wonderful chat about writing, reading, publishing and all things funny and mysterious. Patricia and I had only recently been introduced, but we discovered that we have one thing in common: we’re both past-Presidents of Novelists Inc.
And why he finally decided to walk away from it. We love feedback! Hit that “Leave A Comment” button above and let us have it! 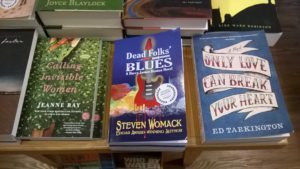 The event was held at the wonderful Parnassus Books in Nashville, and while there, I saw the print edition of Dead Folks’ Blues. Just had to share it. Thirty years ago, I sold my first novel, Murphy’s Fault. It sold in late 1988, but it didn’t come out until 1990. I remember being so thrilled when Mill’s Bookstore (a long-gone local independent) agreed to give me a book signing. I sent out something like a hundred invitations (by snailmail, no less) and dozens of phone calls. Invited every friend, every family member… I was one of the founding members of the Tennessee Screenwriting Association, so everybody in that group got an invite. The signing was on a Sunday afternoon. I was terrified. What if nobody showed up? It was an amazing day. Mills had optimistically way over-ordered, but every one of the 130+ copies they had on hand were snapped up. By the time the signing was over, Michael and Ron Watson were reaching into the front windows to pull out display copies for people. In the 90s, when I was really working this business, I went on a bunch of book tours, almost all self-financed. Most of those signings were like the one that Sharyn McCrumb and I did at a Little Professor Bookstore in Birmingham, where we sat next to each other at the front of the store during a weekday lunch hour. 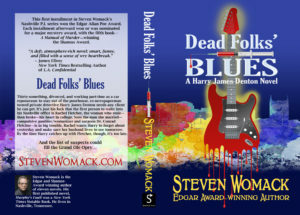 Thanks to everyone who participated in the eBook giveaway for Dead Folks’ Blues! It was so much more successful than we ever imagined. The random giveaway was set up on Amazon.com so that every fifth person who followed me on Twitter got a free eBook. They were all gone in a couple of hours! Thanks again! It was so much fun that we’ll do it again soon! If you haven’t had a chance to read the Harry James Denton books yet, here’s your chance to start. 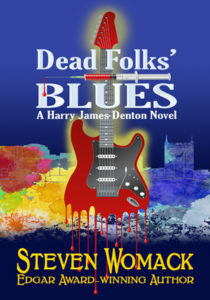 Spearhead Press is giving away 25 free ebook copies of Dead Folks’ Blues. Follow me on Twitter before November 23, 2017 for a chance to win. Click here to enter! Fabulous writer and wonderful panel moderator Genese Davis invited me to be on a panel at WizardWorld Comic Con in Nashville last Sunday, September 10th. 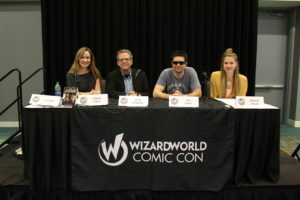 Joe Casey and Jennifer Chesak were also on the panel and it was a great day! Why Everyone Should Consider Going Indie!